What makes Arrowhead Evaluation Services, Inc. different from the others? Our values. As an independent third party, Arrowhead Evaluation Services, Inc. is the top provider of independent medical examination doctors in California. Our panel of ethical and qualified medical professionals have the knowledge and experience to evaluate every type of injury, and are available to serve as medical experts to provide testimony in medical legal cases. Whether you’re seeking a certified medical expert for a Qualified Medical Evaluation, Agreed Medical Evaluation, or Independent Medical Evaluation, Arrowhead can provide the trusted and experienced medical professional you need. We have been serving cities across California since 1987 and our knowledgeable and friendly staff is ready to assist you with any questions you may have. If you would like to learn more about our services, our physicians, or inquire about joining California’s best team of medical experts, contact us today. 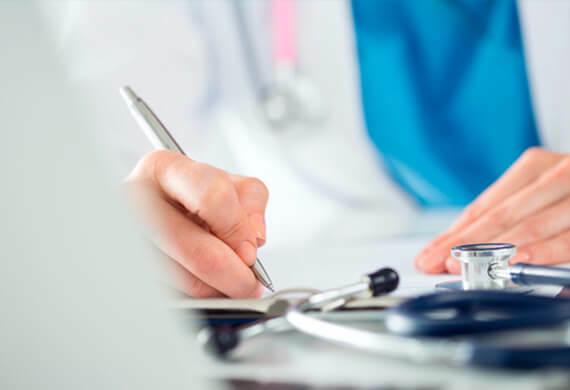 We have built California’s best team of qualified physicians, all of whom are certified by the Division of Workers’ Compensation – Medical Unit, to conduct Qualified Medical Evaluations, or QMEs. Our medical experts will examine injured workers to evaluate disability and compose the necessary medical-legal reports, and those reports will then be used to determine an injured worker’s eligibility for workers’ compensation benefits. Our team of approved QME professionals includes medical doctors, doctors of chiropractic, doctors of osteopathy, optometrists, podiatrists, and psychologists. If you require an experienced medical professional to conduct an Agreed Medical Evaluation, or AME, in order to evaluate an employee’s disability or impairment, consider our team of doctors in California. Our AME doctors are trusted by the medical legal community. When the medical professional is the sole decider as to whether or not there is any disability or impairment as a result of an injury at work, it is imperative to choose a company you can trust to provide experts who are thorough and fair. Reach out today to learn more about our QME and AME qualified medical experts. An Independent Medical Evaluation, or IME, is one of the most important pieces of evidence in any case involving a work-related injury. An IME is most commonly conducted to determine the cause, extent, reasonableness of medical treatment of a work-related injury, or an injury in which liability is an issue. When it comes to IMEs, more of California’s attorneys trust Arrowhead Evaluation Services to provide medical experts with the ethical standards and years of experience necessary to fairly analyze the medical condition and its relation to an event. Contact us today to learn more about the most experienced independent medical examination doctors in California. With the highest reimbursement rates in the industry, more physicians throughout California are deciding to make the most of their QME/AME status by joining the talented and dedicated team of medical experts at Arrowhead Evaluation Services. Our focus is not just to build the largest expert witness network of physicians, but to ensure that our associates are able to reach their fullest potential, by providing ongoing training and professional development. Reputation and credible reports matter in our industry – it’s our people, our personal touch and streamlined medical evaluation process management that make the difference. We’re always on the lookout for qualified medical professionals who are among the best and the brightest in their field to join our team. Learn more about how you can become a medical expert with Arrowhead Evaluation Services today. With well over 100 locations throughout the State of California, we have doctors and locations to serve you. For over 30 years, Arrowhead has been a leading provider of independent medical evaluations in California, with doctors specializing in AME, QME, IME, and medical expert witness services. Find out why we continue to be the Golden State’s most trusted provider of medical experts when you schedule your evaluation today.